Freetimers achieves some quite amazing Google rankings for our clients, and below we provide a list of some of the most notable organic ranks we have won, showing the rank and the amount of competition. Please note this is only a small sample, and for many of our clients we actively work on hundreds of search phrases, and these grow in number, every month. 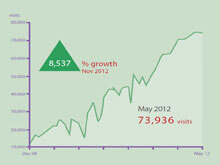 For example, in August 2011, our client Boomerang achieved 78% of all its search phrases in Google's top 5. Similarly for the Garage Door Centre, of its main list of 240 search phrases (keywords), 75% were in the top 5 positions on Google. Unlike many SEO companies, we get results for very very competitive markets, not just for the more niche or local search phrases which are much easier to do well on. Some of the markets shown below are amongst the most competitive on the Internet, so if you really need to get top rankings, you won't do better than Freetimers.